There are so many amazing people in our community who leave their families to serve our community each day. My girls and I pray daily for our police and fire departments, first responders and even our 911 dispatchers. These amazing people and their families are our Hometown Heroes, and we’re so grateful for their willingness to serve and protect our Central Florida community. So, Ellis and I have decided to make sure they know just how much they are loved, and we’d love for your family to help us! 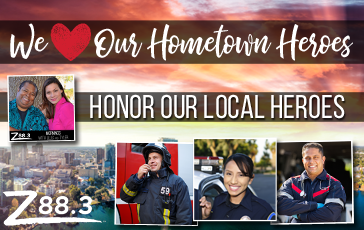 Every Friday morning in February we’re going to put you on the radio sharing a story or a message of thanks and encouragement for our Hometown Heroes. Just call us on Friday mornings in February in the studio (407.682.8888) to be part of it. Thank you for helping show our Hometown Heroes how much they mean to us!